Another crop of "mythologies"--structuralist patterns inside daffy life--from Barthes, pieces that are as close as he ever comes to occasional writing. He considers the Eiffel Tower and finds it "an object which one sees, a glance which is seen; it is a complete verb, both active and passive. . . more the crystallizer than the true object." Anywhere you look in Paris there it is; yet, from its top, "it gives us the world to be read. . . it separates and groups"--and thus, since all panorama is "intellectualist," every visitor is made a structuralist. 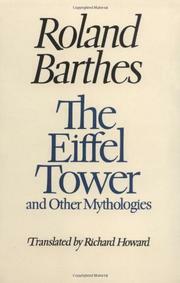 All well enough and true, but it's Barthes' problem (along with that of translator Howard, who tortures Barthes' jargon into "oneiric," "rugosity," "utensility") that we sense him always lounging fiercely upon the Procrustean bed. Even when he's making simple sense--describing how a flood "reconstructs" our perceptions of topology or how the bourgeoisie (whipping-boys throughout) believe "anything which risks substituting an explanation for a retort to be null and void"--the combative, often snide mentalism of his stance, plus the laboring of the obvious (he discovers that Billy-Graham religion is anti-intellectual), so insistently waffles that it begins to seem merely a trick; the abstract shapes of Barthes' innate structures definitely kneel down to ordinary life--and that's off-putting. Minor, dated work to begin with (some go back 20 years), these pieces make even less of an impact as an export.